Roasted Beet & Feta Salad is perfectly roasted beets on top of a bed of baby lettuce with chopped pecans and feta cheese sprinkled on top. Weight Watchers friendly recipe- 4 SmartPoints! Going to a farmer’s market is like heaven on earth for me. Fresh and local produce, local made breads, and local meats. I could spend hours just walking up and down each aisle, smelling every fruit and admiring every vegetable. 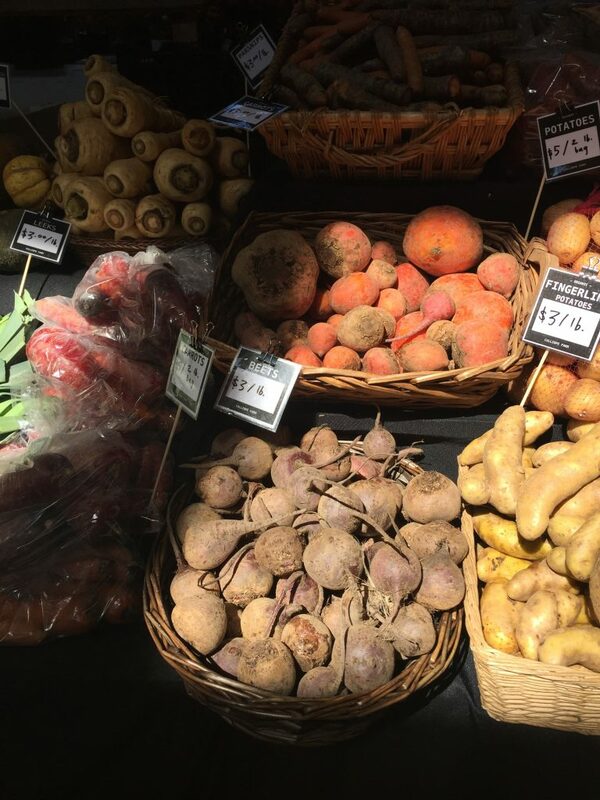 One of my favorite vegetables to buy at a farmers market are beets. My Roasted Beet & Feta Salad is a delicious, sweet yet savory salad great for lunch or dinner. Perfectly roasted beets on top of a bed of baby lettuce with chopped pecans and feta cheese sprinkled on top. This is a Weight Watchers friendly recipe and each serving is 4 SmartPoints. Earlier this summer, my husband and I took a trip to Olympia, Washington to visit some friends of ours who used to live in Austin with us. My husband and I absolutely LOVE the Northwest and have dreams of someday living there in the mountains and by a lake. The Northwest is breathtakingly beautiful and so different from the landscape we live in. During our visit, my husband went with “the guys” on an epic river fishing trip and I stayed back in Olympia with “the girls”. Olympia is about 45 minutes away from Seattle and such a cute little city. Artsy, kind of a hippie vibe, with fresh local vegetables everywhere you look! Oh and coffee shops everywhere! Since the guys were gone, it was just us girls so it was the perfectly opportunity to cook for someone other than my husband. My girlfriend suggested that we go to the local farmer’s market to buy ingredients to make for dinner… and I was immediately in my happy place! 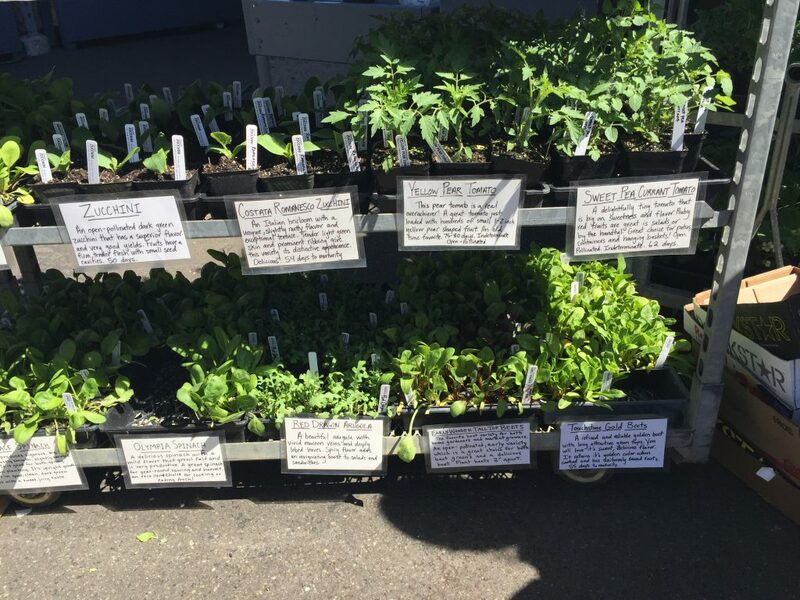 My husband and I go to our local farmers market almost every Saturday, so it’s a real treat to go to a different farmers market, especially in a different part of the country. 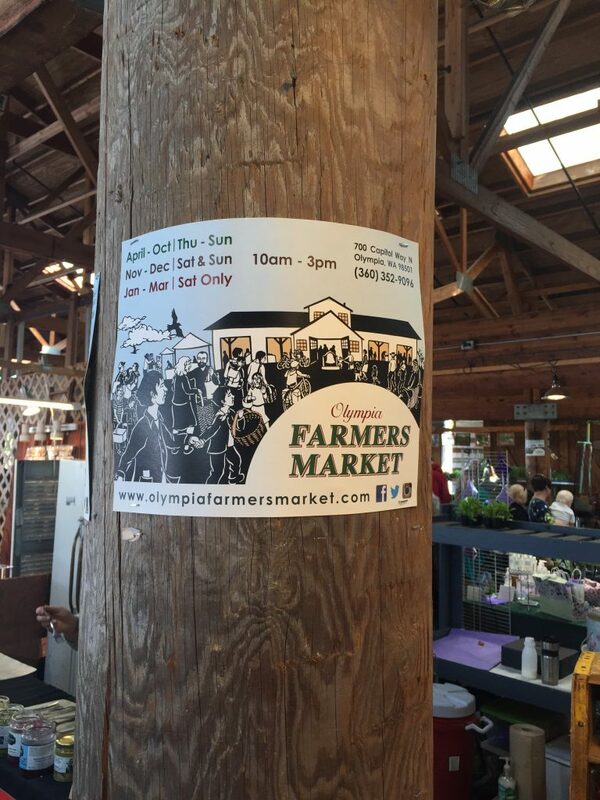 The Olympia Farmers Market was filled with so many amazing vendors and local farmers, and located on the banks of a lake. When we first arrived, I was instantly in love… a huge display of local tomatoes and lettuce plants that were ready for you to take home in plant. If only I had lived in Olympia so I could take them home 😉 . **Disclaimer: after this trip when we got back home, I immediately went to the garden store and bought several seedling plants. Thank you Olympia for the inspiration! After walking around the market for a while, I finally decided it was time to put together a dinner menu and was instantly drawn to beets. I absolutely LOVE beets and didn’t start cooking with them until a few years ago when I was vegetarian. One of my favorite ways to cook beets, is to roast them and eat them cold on a salad. 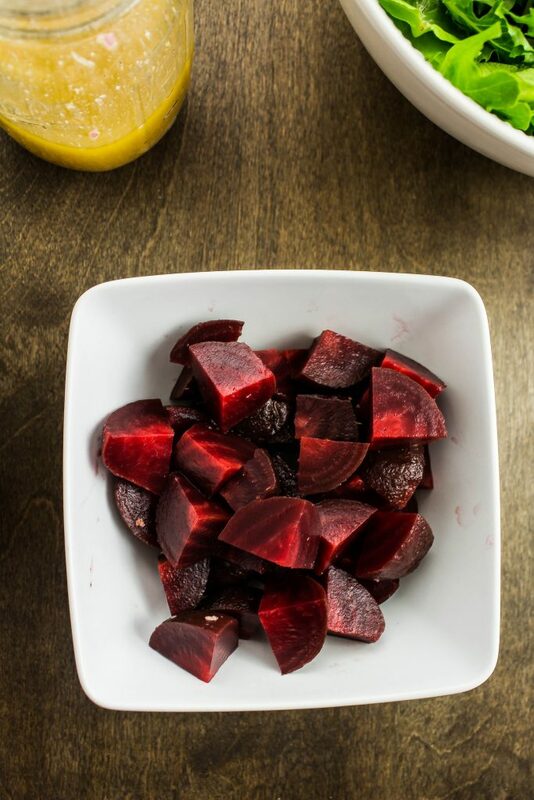 Roasting beets is way easier than you think! Just preheat an oven to 375 degrees, coat the beets (with skin on) with olive oil, salt & pepper, and wrap in aluminum foil. Roast for 50 minutes until beets are tender. Once roasted, remove from the oven and let the beets cool, then remove the skin. If roasting whole beets is a bit intimidating for you, no problem! At my grocery store in Indianapolis (and back in Austin), in the produce section there is already roasted beets packaged and ready to eat! These beets have been roasted and peeled. All you have to do is remove the beets from the package and dice up! 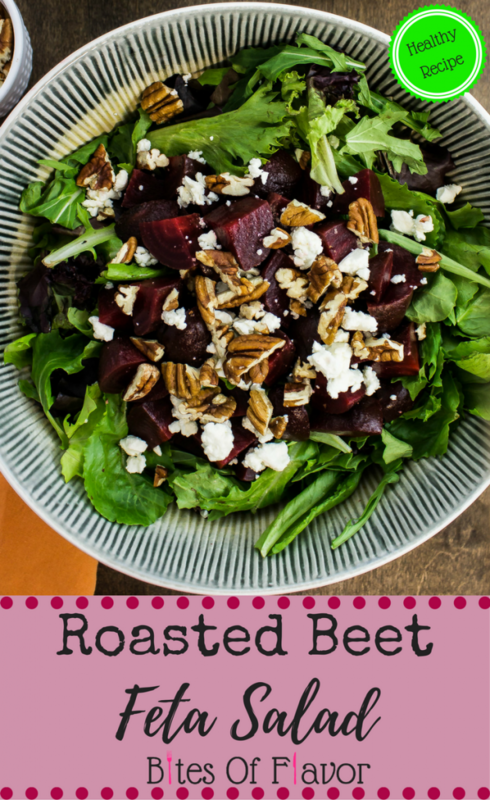 If you decide to buy already roasted beets, this salad will be made in no time! 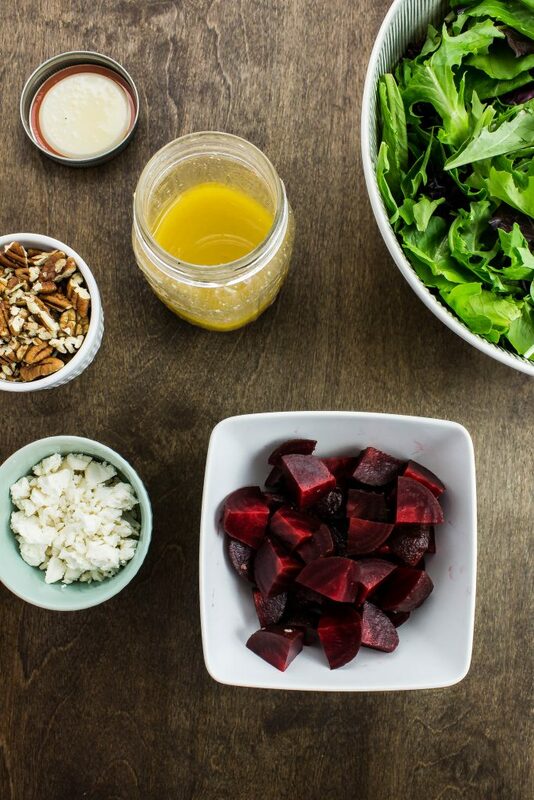 Dice up the beets, chop up some pecans, and make my 5 Minute Honey Dijon Vinaigrette. 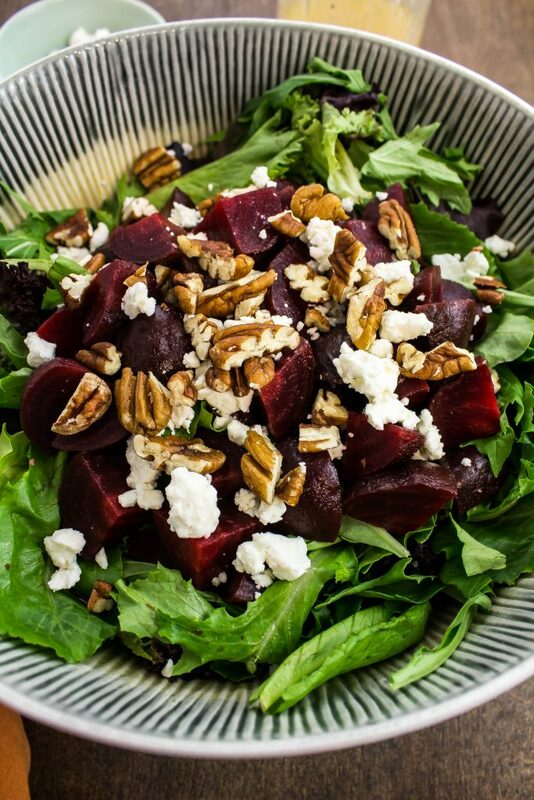 To a large bowl, add baby lettuce, diced beets, chopped pecans, feta cheese, and drizzle the top with the dressing. 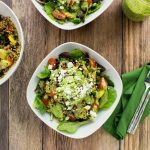 This salad is delectable, sweet yet savory, and will convince those “non-beet” eaters to love them! Roasted Beet & Feta Salad is great for lunch or dinner. Perfectly roasted beets on top of a bed of baby lettuce with chopped pecans and feta cheese sprinkled on top. My 5 Minute Honey Dijon Vinaigrette goes perfect on top of this salad! Only 4 Weight Watchers SmartPoints, including the dressing! Coat beets with olive oil and season liberally with salt and pepper. Wrap with foil, place on a baking sheet, and roast for 50 minutes or so until soft. Once cool enough to handle, gently remove skin. Dice beets and set aside. 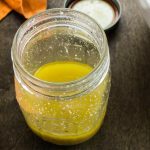 Make 5 Minute Honey Dijon Vinaigrette according to recipe instructions. Chop pecans and set aside. To a large bowl, add baby lettuce, diced beets, chopped pecans, and feta cheese. Mix well. 4 servings per recipe with 2 teaspoons 5 Minute Honey Dijon Vinaigrette per salad. Nutrition and Weight Watchers calculation includes vinaigrette in the total. 2 teaspoons of vinaigrette per serving. 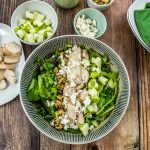 September 15, 2017 at 10:57 am This salad looks stunning. I have to try this out this weekend! September 18, 2017 at 8:56 am Thanks Caitlin! I hope you try this salad soon. September 15, 2017 at 3:04 pm I've never had beets but I keep hearing how healthy they are. I need to look for the already cooked ones at my grocery store and give them a try. Your salad looks amazing! Heather recently posted...Stock Your Freezer the Easy Way! September 18, 2017 at 8:56 am Yes! Definitely start with the already roasted beets if you've never tried them before. They are cooked perfectly. September 15, 2017 at 3:25 pm Oh this looks so delish! I haven't had beets in forever! I definitely need to try an make this super soon. September 18, 2017 at 8:56 am I hope you try this soon Kristen! September 15, 2017 at 3:48 pm This looks awesome!! My husband loves beets and I'm a huge feta fan! I'm totally adding this to our new recipes to try out. September 18, 2017 at 8:55 am Feta and beets are such a great combo of flavors! September 18, 2017 at 8:55 am Wow, that's amazing that you liked beets as a kid!! 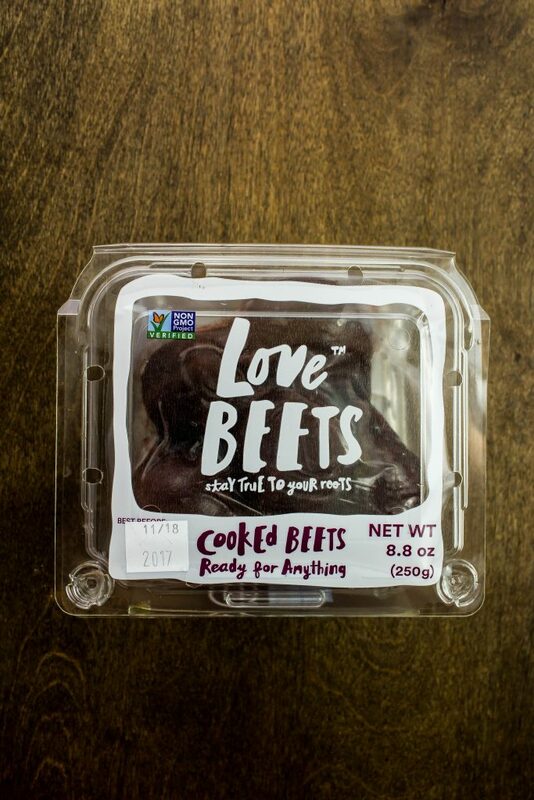 I totally agree about Love Beets.. it's nice that they are already roasted so you don't stain your hands :)!! September 15, 2017 at 11:18 pm Yum! This sounds fantastic! 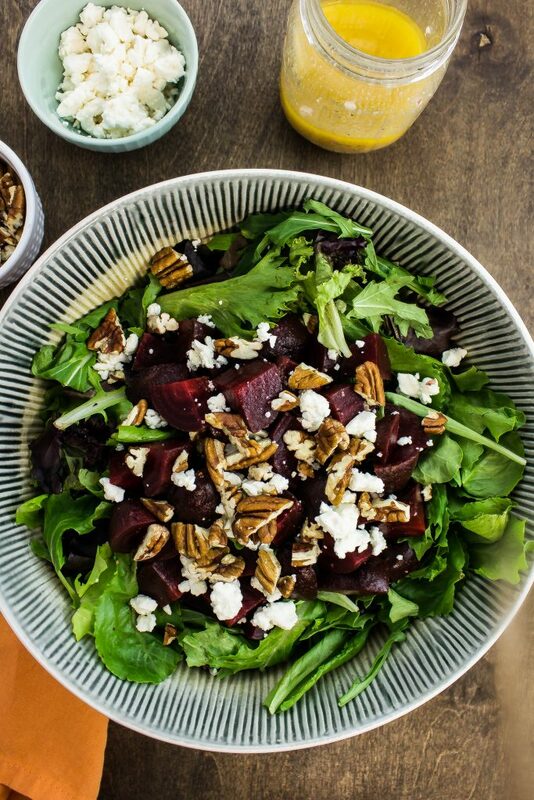 I love feta and pecans, and in a salad with beets sounds amazing. That Farmer's Market sounded wonderful too. I've always wanted to visit Washington. September 18, 2017 at 8:54 am Washington is amazing! You need to go!! September 16, 2017 at 9:36 am This looks absolutely delicious! I'm a big fan of feta, and am always trying to find good ways to fit in beets. Thank you! September 18, 2017 at 8:53 am Oh I love feta and beets so perfectly with it! Thanks Melissa! September 18, 2017 at 9:05 am This looks delicious, I love beets in any form! Sarah recently posted...13 Ways to Reduce Sugar Intake and Save Room for Dessert! September 21, 2017 at 10:04 am Thanks Sarah! 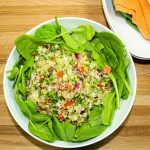 September 18, 2017 at 9:58 am This salad looks incredible. I've had roasted beet salads before but this one looks really good. 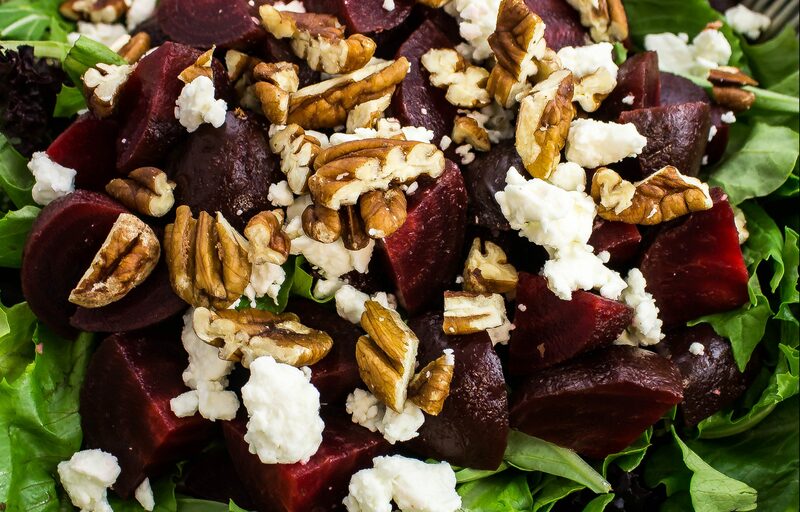 The sweetness of the beets pairs great with the salty freshness of the feta and pecans. Great recipe. September 21, 2017 at 10:04 am Yes! 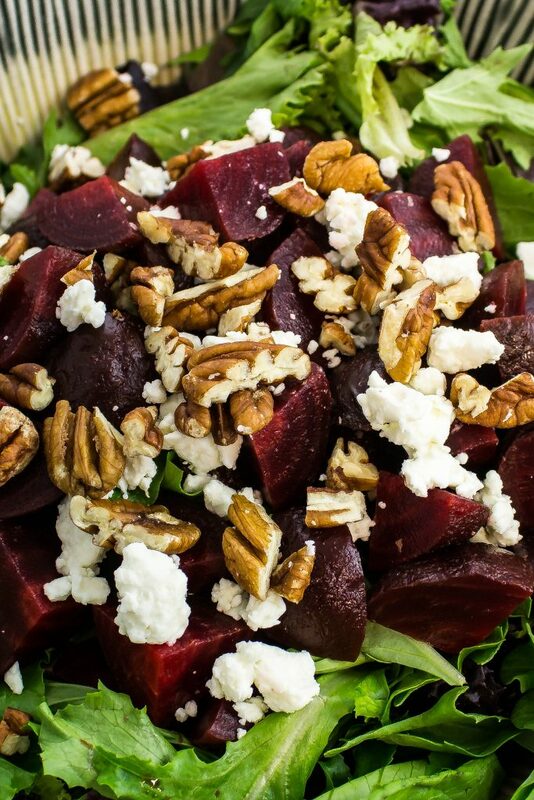 I love the sweet and salty pairing of the beets and feta, with the crunch of the pecans. Thanks Kristen! September 18, 2017 at 10:00 am This recipe looks so delicious and easy to make. I cant wait to try it. September 21, 2017 at 10:02 am It's super delicious!! September 25, 2017 at 6:05 pm I hope you try it Stephany!